In a Nutshell: Taking cues from other social media networks, eToro has harnessed the collective knowledge of the masses and turned it into an investment platform that benefits new traders and rewards successful investors. This interaction and groupthink mentality has been shown to improve overall returns on investments over time and is especially beneficial for those new to trading, who can copy the strategies of the site’s successful traders in real time through its CopyTrader™ technology. 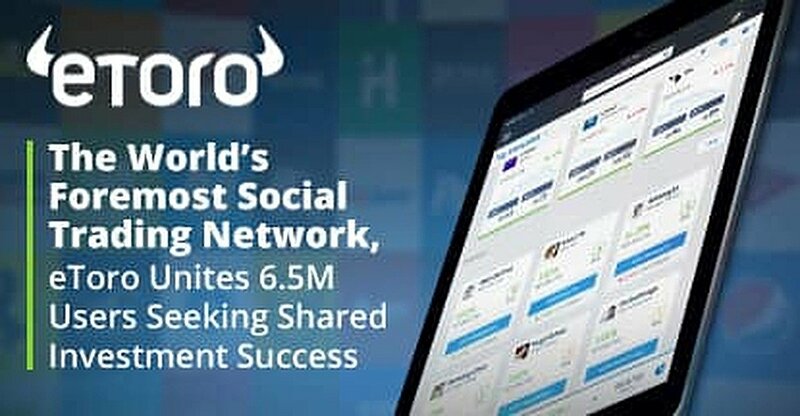 Today, eToro is the world’s largest social investment network. To many, the world of investment trading is far scarier than the average horror movie at your local theater. Terms, research, constant streams of news, and so many other variables make it hard to trust that your hard-earned money is safe with any given investment. Television and the internet broadcast stories of people who trusted the wrong person and lost their life savings in the blink of an eye. Savings accounts are much safer, right? With the interest yield of modern savings accounts down to almost nothing (and in some countries, in the negative), investing money has become a preferred method of seeing funds grow as we save for retirement, a new home, or any other large expense. Almost every town in America has money managers ready to take your funds and put them to work without ever really opening the curtain to let you see where your money is being directed. eToro bills itself as “the world’s leading social trading network.” Since 2007, the company has taken cues from social media websites, like Facebook and Twitter, and used them to create a platform where investment traders can interact, learn from one another, and meld their knowledge to improve their odds of making their investment dollars grow over time. In the last 10 years, the company has grown to more than 6.5 million users in 170 countries. Some have seen significant returns on investments. It’s through those traders that eToro looks to help other investors navigate the complicated landscape of investing. Iqbal Gandham, Managing Director for eToro UK, told us the site helps new traders benefit from successful ones. And if imitation is the sincerest form of flattery, eToro allows each of its users the opportunity to not only learn from the platform’s top traders, but to copy their every move. It turned out that Burton was wrong. The monkeys were actually better in choosing a winning portfolio than the experts. According to an article published by Research Affiliates, the average dart-throwing monkey outperformed the index by an average of 1.7% per year since 1964. That doesn’t bode well for the thousands of money managers worldwide, who make their living off managing money for investors who aren’t comfortable with making their own investment calls. eToro’s CopyTrader program aims to alleviate some of the concerns that most of those traders have. Through the company’s social platform, traders can view the history of many top traders on the website – from their three-year historical returns, their archived social interactions with other traders, and their overall risk tolerance. If the user is impressed with the results, the trader can choose to copy the trades made by that person. Each trade is executed at the exact same time and at the exact price, which cuts out the potential conflict of interest on the copied trader’s behalf. It also takes some of the guesswork out of picking stocks for a newcomer to the investment world. You can find proven traders, talk to them, and learn from their strategies in real time. Iqbal says that, from a sample of 134 million copied trades prior to 2015, around 80% were profitable. According to him, that edge comes from strength in eToro’s social community and groupthink ideology. While CopyTrader is a popular feature on eToro’s platform, it is not a requirement. Individuals can trade on their own and use the portfolios of the site’s top traders as research without fully copying their trades verbatim. Traders who want to diversify their holdings away from single stocks can do so with the company’s latest technology. Many people tend to shy away from investing in individual companies. The level of research and data they must sift through to gain the proper amount of comfort in one entity is time-consuming and daunting to most. That’s why index and sector funds have become so popular in the past decade, and it’s why eToro created its CopyFunds technology. Funds like these collect groups of stocks in related areas and place them in one basket that allows an investor to diversify his or her holdings without risking exposure to just one company. Purchasing into that fund buys an allocated amount of all of the companies in the fund at once. That allows traders to hedge their bets on an entire sector instead of the performance of just one entity. In an attempt to set itself apart from other funds available to investors, eToro created a pair of different CopyFunds for investors to use. The Market CopyFund uses historical data to pick the top performers from any given sector. The Top Trader CopyFunds uses an algorithm to determine the top stocks in a sector based on the holdings of the top traders on the platform. eToro has taken these traders and combined their knowledge to create funds based on their picks of the top stocks in several categories. 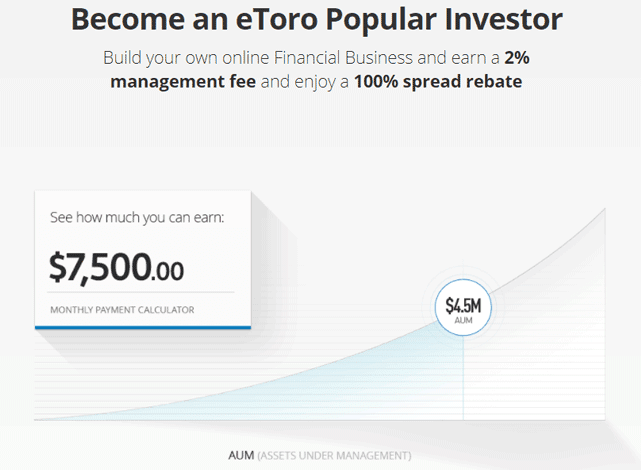 Investors interested in banks can buy into the eToro Financials Fund. Instead of buying into one bank, this fund bundles the top six or seven in the category and invests evenly among them. There are funds for tech, medical, and even a generic fund that groups the top overall stocks based on their most copied investors. In all, there are dozens of sector funds to choose from, including one on cryptocurrencies, such as BitCoin and Ethereum, that launched in 2017 called Cryptocurrency CopyFund. Each comes fully allocated when the money is invested in the fund. For the seasoned trader looking to capitalize on their proven track record, eToro has a Popular Investor program that rewards users who are copied by other traders on the platform. The program gives eToro’s top investors an opportunity to start their own financial business and earn fixed payments up to 2% of their annual assets under management. Payments are credited to Popular Investors as real, immediately withdrawable funds, on top of any profits made on their regular investments. Iqbal said that some of the Popular Investors on the platform have been able to leave their regular jobs and focus solely on their portfolios because of the commissions earned through Popular Investors. The Popular Investor program rewards the platform’s most successful and interactive traders. Members of the group have regular interactions on the social platform on eToro, answering questions, engaging in conversations about trades, and addressing their own opinions on speculations on the market. Trading was never meant to be about luck. After all, you’re risking your real, hard-earned money in an investment with the hope that it will fund your future goals. The average amount of time it takes to remove the luck factor from trading is what scares away most novice traders. Most beginners also have issues with patience and letting their holdings take the typical roller-coaster ride that stocks take. Hiring a professional can be expensive and can eat away at any potential investing profits. eToro’s goal is make investing easier for everyone, with less cost and more interaction on its social platform. Thousands of discussion posts on eToro’s website every day are meant to be both educational and enlightening. With the average return on investments falling around 10% before inflation and 7% after inflation over the last 100 years, patience can be a key to growing your funds over long periods of time for, say, retirement. But short-term investment goals, like a new house or other large purchase, may demand a much shorter time frame. While those types of investments typically involve a much higher risk tolerance, they can be achieved through proper knowledge and education. eToro’s social platform looks to provide that education with its transparent access to trading history and average returns (some as much as 64% over a six-month period). The company’s goal is to be a platform where traders can meet, mingle, and learn so they don’t have to rely on a monkey throwing darts to decide on their financial futures.